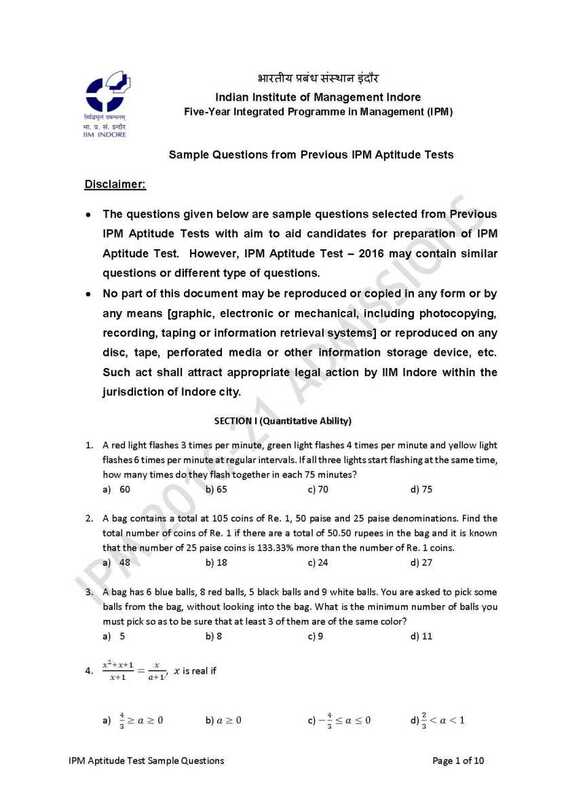 Iâ€™m looking for IPM Aptitude Test exam paper issued by Indian Institute of Management Indore, so that I can solve it easily? 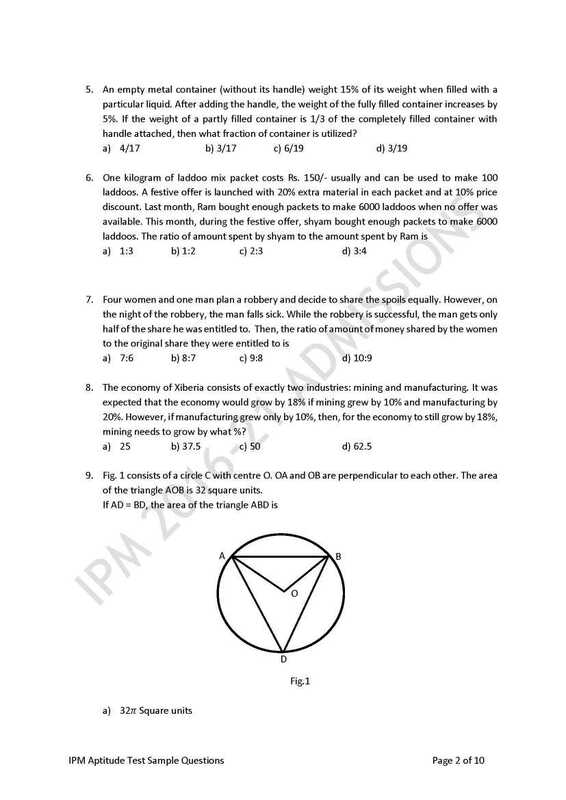 On your demand I will get the Indian Institute of Management Indore, IPM Aptitude Test exam paper so that it would be easy for you to prepare. A red light flashes 3 times per minute, green light flashes 4 times per minute and yellow light flashes 6 times per minute at regular intervals. If all three lights start flashing at the same time, how many times do they flash together in each 75 minutes? A bag contains a total at 105 coins of Re. 1, 50 paise and 25 paise denominations. 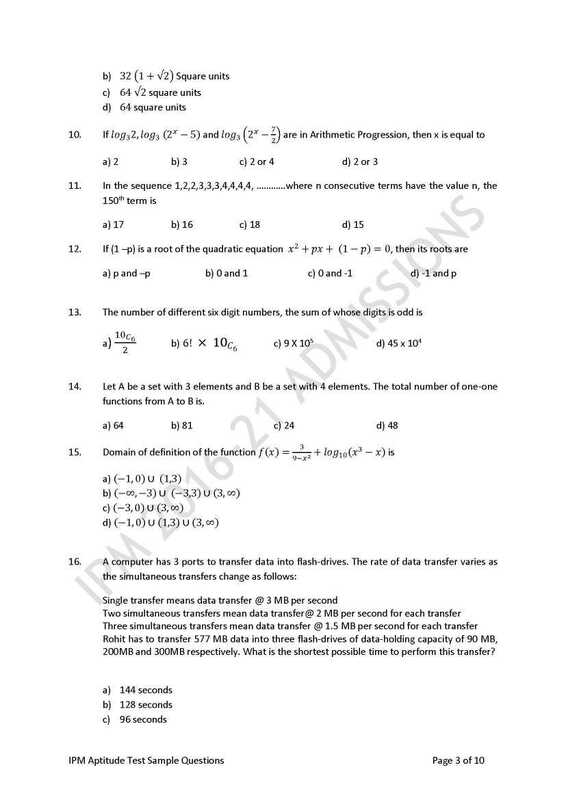 Find the total number of coins of Re. 1 if there are a total of 50.50 rupees in the bag and it is known that the number of 25 paise coins is 133.33% more than the number of Re. 1 coins. An empty metal container (without its handle) weight 15% of its weight when filled with a particular liquid. After adding the handle, the weight of the fully filled container increases by 5%. If the weight of a partly filled container is 1/3 of the completely filled container with handle attached, then what fraction of container is utilized? Two boats in a current-free lake start sailing towards each other from a distance of 140 kilometres. At the same time, a fish touches boat A and swims towards boat B. As soon as it touches boat B, it swims back to boat A. The process continues till the boats collide. The boats sail at a constant speed of 16 kilometres per hour and 12 kilometres per hour. The fish swims at the constant speed of 5 kilometres per hour. After swimming for 40% of the total time between start and collision, the fish gets tired and reduces the speed to 3 kilometres per hour. What would be the total distance swam by the fish till the boats collide?